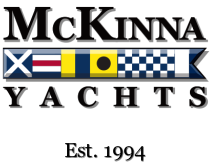 Join the McKInna Family Today! The new McKINNA 62 Express Yacht is an example of doing it right. The "platform" is the Howard Apollonio-designed hull that has been used on other McKINNA, most notably the 60-foot Express, which have well-proven records for seaworthiness and comfort. At the prodding of Bob Crow, co-founder of Generation Marine, the East Coast MCKINNA distributor, the new 62 became a reality by stretching the hull slightly and penciling in an entirely fresh layout. Working with designer J.C. Espinosa, the result is a very clever design that might best be called a "cockpit express cruiser." With the addition of the water-level cockpit, the inflexibility of express cruiser styling has been removed. Let me count the ways. It's a great place for the family barbecue, with a forward console that includes a Kenyon barbecue and Isotherm fridge. The transom door makes it safe for kids, but allows easy boarding from the tender. And, with the optional lifting stern platform, you can launch your tender at the push of a button or create a submerged "beach" for water fun at anchor. The cockpit has two big lockers with lift-out bins, giving full access to both sides of the Onan 21.5 kW generator in the lazarette, as well as to the rudders and steering systems. The cockpit also has two oversized freeing ports and teak steps leading to the wide side decks notable for the solid (not wire) double lifelines with oversized upper rails. Forward, the anchor windlass is recessed with protective hatches and features remote control from the helm. Access to the engineroom is also civilized, with a door in the cockpit console-unlike many express cruisers that rely on a hatch and ladder. Once inside the engineroom, well, it's party time, with 6 1/2 feet of headroom and plenty of room to work around the 1,015-horsepower Caterpillar C18 diesels. High quality equipment, such as Racor filters, Groco through-hulls, and a Sea-Fire halon system, make this an impressively fitted yacht. The finish is an easy-to-clean glossy white, with nonslip flooring for safety. Up the molded stairway from the cockpit, what might have been sunpad space has become an alfresco settee and table, all partially shaded by the hardtop. Inside the stainless steel sliding doors of our pilothouse version, the air-conditioned bridge has a settee wrapped along the portside and a wet bar opposite with twin bar stools. An open version without the doors is also available, with the bar cleverly rearranged to provide forward-facing stools, a counter for the settee, and a U-shaped wet bar to create a social center. Both have an immense electrically operated sunroof to provide fresh air and light when desired. The helm is stylish, with a recessed, aircraftlike instrument panel with a slight cowling to prevent reflections. There's ample room for large flat-screens, and electronics are standard-including a computerized monitoring system, radar, GPS, VHF, autopilot, and satellite receivers. The line of sight? Simply excellent all around. Go below and you're immediately struck by the immense space, accented by untouchable headroom. The salon spans the full 17-foot, 3-inch beam, with a trio of lozenge- shaped ports on each side for light. There's a wraparound lounge that faces a Pioneer 42-inch pop-up TV to port, and the after port corner is dedicated to the galley, complete with a granite counter that doubles as a breakfast bar with three stools. Because the overhead is open to the bridge, there is a skylight effect and guests in the salon can converse with those on the bridge. Like the rest of the 62 Express, the galley features quality appliances, from the Kenyon four-burner cooktop to the full-size Sub-Zero fridge and twin Sub-Zero freezer drawers. Just aft of the salon and down a step is the master suite, also using the full beam to advantage, with a walkaround queen-sized berth, more large ports, and cedar-lined lockers and bureau. A pair of nightstands are built in, the headboard is a combination of padding and beveled mirror, and a vanity is tucked in one corner. One key to this abundance of space is the pocket door for access to the master head, which has a marble sole and counter, combination shower and tub, and a Headhunter toilet. Forward, the VIP stateroom also has a queen-sized walkaround berth, a vanity, and built-in drawers. The guest head, with shower, doubles as the day-head, with access from either the VIP or the salon. The MCKINNA 62 Express has the high-gloss African cherry interior that lends a warm and traditional look, while a pale anigre finish is also available. Small touches are worth noting, such as the slotted paneling for the air conditioning outlets rather than bolted-on plastic vents. At 2000 rpm, she moves at 27 knots (and just 70 decibels) which, combined with her shallow draft, is a good reason why the 62 Express would be such a great Bahamas boat. Cast off, set the throttles for a comfortable cruise, and you'll be snorkeling the reefs in no time. The standard equipment list on the MCKINNA 62 Express is long and distinguished, including Glendinning Cablemasters, a full satellite TV system and TVs everywhere, bow docking lights, a bow thruster, underwater lights, a Muir 3,500-pound windlass, a Charles Industries Isoboost transformer, and Nibral 5-blade Fast props. She is thoughtfully well-equipped.